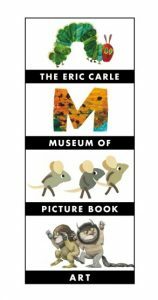 Eric Carle and his wife, the late Barbara Carle, co-founded the Museum is November 2002. Carle is the renowned author and illustrator of more than 70 books, including the 1969 classicThe Very Hungry Caterpillar. Since opening, the 40,000-square foot facility has served more than half a million visitors, including 30,000 schoolchildren. The Carle houses more than 13,000 objects, including 6,600 permanent collection illustrations. The Carle has three art galleries, an art studio, a theater, picture book and scholarly libraries, and educational programs for families, scholars, educators, and schoolchildren. Educational offerings include professional training for educators around the country and Master’s degree programs in children’s literature with Simmons College. Museum hours are Tuesday through Friday 10 a.m. to 4 p.m., Saturday 10 a.m. to 5 p.m., and Sunday 12 noon to 5 p.m. Open Mondays in July and August and during MA school vacation weeks. Admission is $9 for adults, $6 for children under 18, and $22.50 for a family of four. For further information and directions, call (413) 559-6300 or visit the Museum’s website at www.carlemuseum.org.